Interesting article discussing the culture, and/or the lies about the stereo-typical “hacker”. I remember, reading a book in high school (can’t find the title now), that mentioned stuff about your average hacker, and how the stereotypes back in pre-2000 were that they are fat, and have cats, and attempted to disprove those stereotypes. We all know this one quite well. Some of the most dangerous hackers—the myth goes—wear black T-shirts, have long hair and are under 30 years of age. Hacking may be a predominantly male activity but that doesn’t mean that there aren’t female hackers out there. The way we paint hackers today elevates them to a level of unmatched technical prowess. Using this platform of expertise, they compromise any system they want with ease, regardless of whatever security protocols may be in place. The notion that all hackers intend to cause harm is one of the biggest hacking myths today. Another Story Of A ‘Fake’ Brilliant Inventor? Is ‘Scorpion Walter O’Brien’ A Real Computer Security Genius? There’s apparently a new TV show on CBS called Scorpion that has received mixed-to-decent reviews. It supposedly is about some computer security geniuses/outcasts who help “solve complex, global problems.” However, Annalee Newitz’s description of the stupidest, most batshit insane hacker scene ever from the first episode, suggests that the show is not worth watching. In the past few years, it had been kind of nice to see Hollywood actually seem to have some clue about accurately portraying hacking in some situations, but that’s all apparently been tossed out the window with Scorpion. Even if you don’t read Newitz’s story (or view the video clip), just know it involves an ethernet cable hanging from a flying plane with a car racing beneath it to download some backup software needed by the airport so planes can land. Yeah.A big part of the show’s marketing is the claim that the story is partially based on the life of one of the show’s executive producers, Walter O’Brien. CBS News has an article talking up these claims of O’Brien’s amazing feats, helping out its parent company, CBS, who broadcasts the show. But… for such a “genius,” many of O’Brien’s claims are coming under scrutiny, and they’re not holding up well. Having just gone through the whole Shiva Ayyadurai / inventor of emailcrap, it’s beginning to sound like a similar case of someone pumping up their own past for publicity purposes. Elsewhere, he claims that he was “diagnosed as a child prodigy with an IQ of 197.” First off, there are significant questions about IQ as a particularly useful measurement of anything. Furthermore, the idea that there’s some definitive list of those with the highest IQs seems equally questionable. A quick Google search will show you a whole bunch of “top 10 lists” of IQs — all of them different, and none of them including anyone named Walter O’Brien. O’Brien’s story started unraveling when he made the somewhat unwise decision to do a Reddit AMA. Redditors are pretty good at sniffing out completely bogus claims, and it didn’t take them long here. Also, Asher Langton has been doing a bang up job debunking basically every claim that O’Brien makes. Again with the odd, and oddly specific claims. They have knowledge of 413 technologies? Do they have a list somewhere? Does it include the coffee machine in the lunch room? Did they send someone out to get the new iPhone 6 to make it 414? Either way, there are… just a few problems with these claims. As Langton points out, the “headquarters” of Scorpion Computer Services Inc.does not appear to be a particularly large or impressive company. Its headquarters is actually… a UPS store address That report notes that it has one employee, and revenue of $66k. It’s possible that the report is inaccurate, but for such a big and successful company, you’d expect to see… at least a bit more historical evidence of its existence. But there is none. 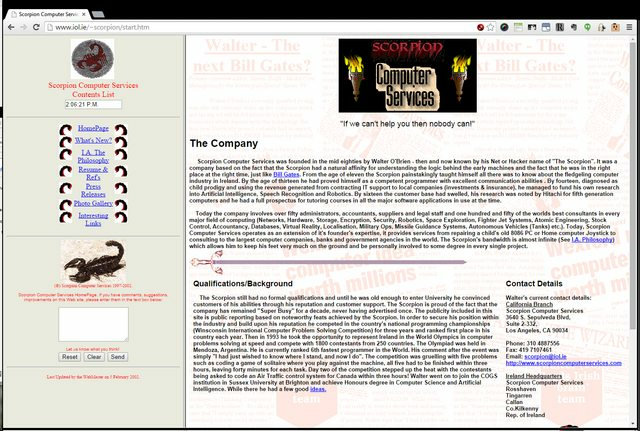 And then there’s this page (and here’s the web archive version in case O’Brien figures out how to delete the old page), which apparently used to be the site for Walter’s Scorpion computer Services, that, um, looks like it was built on GeoCities — complete with the animated fire torches next to the dreadfully designed logo. For a big, massively successful company… you’d expect, um, something a bit more professional. Walter’s own Linkedin profile notes that he actually worked at Capital Group for a while, with redditors claiming he was just a QA guy there, though his profile says he was a “technology executive.” Many other claims on the company’s website read like self-promotional gibberish. “We saved $43 billion in opportunity risks over a five-year period.” “We invented an efficiency engine that performs 250 human years of work every 1.5 hrs with over 99% improvement over human error.” By the way, the “see how” link on that last one doesn’t actually show you “how” it just takes you to a page about how the company is a value added reseller “for proven IT products.” The entire website looks like gibberish from someone trying to sound like a real tech company. It reminds me of Jukt Micronics. Basically, everywhere you look, O’Brien’s claims are either massively exaggerated to downright ridiculous. Sixth fastest programmer in the world? Really? Some folks on Reddit noted that it doesn’t appear Ireland competed in the “International Olympiad in Informatics” in 1993, though someone else found a report from the University of Sussex, which O’Brien attended, noting that O’Brien hadcome in 6th in a different contest, but in the Olympiad itself, he came in 90th. I mean that’s great for an 18 year old, but it hardly makes him into some programming genius. And we won’t even touch the claims that his programming helped catch the Boston Marathon bombers, because… well… really? Frankly, the parallels with Ayyadurai and the email story are there. It certainly appears that, like Ayyadurai, O’Brien was a bright kid who did some impressive programming as a teenager, but then didn’t appear to amount to all that much noteworthy beyond that. Try searching for any news references or evidence of O’Brien doing anything other than in the last few months in the publicity leading up to this new TV show. However, he is trying to reinvent himself and rewrite his history as some sort of genius programmer responsible for all sorts of amazing things, very little of which seems directly supportable. Of course, CBS doesn’t really care, so long as they have a fun TV show that people watch, but at the very least, they shouldn’t continue to spread the exaggerated myths about O’Brien that appear to have little basis in fact.